For most, Mother’s Day marks the day you can begin your outdoor planting. From digging holes for annuals to purchasing bags of mulch, late spring and early summer are perfect for beautifying your yard. If you have the time and energy but lack the money to transform your outdoor space, you should know that some simple and affordable landscaping ideas look professional and can change your outdoor area by doing more than planting pretty flowers and foliage. Add a flower bed border. One of the cheapest and easiest ways to improve the look of your yard is to add a stone edge and mulch to pretty up a plain flower bed quickly. Not all border stones are expensive; many can be found at an outdoor landscaping store for as little as a couple dollars apiece. If you’re looking for something free, find the closest water source and load up on river rocks or beach cobblers, or stop at a demolition site, a quarry, or new building site to find stones. Want something other than stone? Plenty of other materials, like used tires, logs, and cross-ties that can make interesting and inexpensive landscape borders. Camouflage your AC unit. Air conditioning is a necessity, but an exposed unit can make for quite an eyesore in your yard. 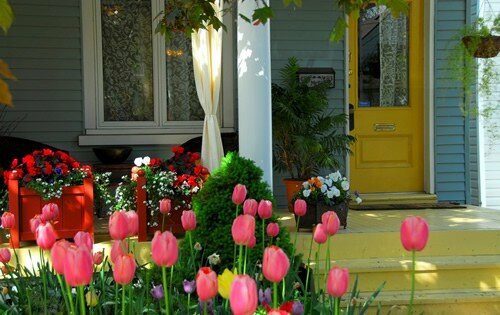 There are many creative ways to cover your unit, while simultaneously sprucing up the look of your yard. From latticework to stacked pallets to wooden enclosures that include planter pots, use the covering as a decorative statement without spending too much, if any, money. Design and install a DIY water feature. Fountains can bring soothing sounds and mesmerizing movement to a garden. Even if a full-size fountain is out of your price range, there is nothing stopping you from building your own version on a smaller, more affordable scale. To create a water feature, all you need is a pump, tubing, gravel, and waterproof pots. Some of the most stunning water features have been made using repurposed urns, tiered ceramic pots, glass table tops, recycled tires, and even wooden whiskey barrels. Add landscape lighting. Landscape lighting is not only aesthetically pleasing, but it is also a safety feature that ensures that paths and obstacles are visible after sunset. Outdoor lighting does not need to be expensive. Outdoor LED lighting can be found at local stores, including both supercenters and discount stores. Lighting can include string lights, solar lamps, lanterns, and path lighting. For decks, you may want to look at wire or rope lights that will illuminate the area where you relax. Create yard islands or berms. Berms, or small mounds, are often used to create a border between properties or break up a monotonous yard. Likewise, island beds can become a focal point in an otherwise boring outdoor space. Island beds and berms look best when you organize plants of different heights around the edging, with taller plants and shrubs in the middle and smaller plants around them. Contrasting or complementary colors can make your bed stand out. Don’t forget to make a delineated edge and use a dark, rich mulch that will enhance the colors of your plant choices. Revamp your outdoor furniture. No matter what you to do your yard, if your outdoor furniture has passed its prime, your space will not be optimized. Giving your furniture a makeover may not be as expensive as you think. With a little bit of inspiration and a can of spray paint or paint sprayer, you may find a new chair hidden beneath that old white wicker or an inspirational place to eat lurking under that rusty metal picnic table. Restaining your wood furniture, and then adding a pop of color with a bold red or sunny yellow cushion may transform your worn out Adirondack chair. Don’t forget a new umbrella to spruce up your picnic ensemble! Use stepping stones to connect spaces. If you want to create a sense of unity between areas that currently only sport a well-worn walking path, consider using stepping stones. While cheaper concrete stepping stones may look pretty drab, consider painting them in colors you pull from your outdoor furniture, in flower designs, or spray paint them with a white lace pattern using an old doily. There’s nothing holding you back but your imagination! What are some creative ideas you have had for inexpensively transforming an outdoor space? Have any of your projects been particularly successful? Share your ideas for sprucing up the yard on a budget in the comments.